Post: Gaurav Akrani. Date: 6/30/2010. Comments (2). Label: Management. Motivation is next to directing / leading. Managers can motivate their subordinates while guiding them. Motivating means encouraging people to take more initiative and interest in the work assigned. It is an art of getting things done willingly from others. Motivation avoids clashes and non-cooperation and brings harmony, unity and co-operative outlook among employees. Managers have to work as motivators of their subordinates. For this, effective communication, proper appreciation of work done and positive encouragement are necessary and useful. Motivation is inspiring and encouraging people to work more and contribute for achieving the objectives of the company The creation of the desire and willingness to perform the job efficiently is known as motivation. Motivation is a psychological and sociological concept as it relates to human behavior and human relations. It is the most fundamental and all pervasive concept of psychology. For motivation, sweet words are useful but are certainly not adequate. Motivation basically relates to human needs, desires and expectations. 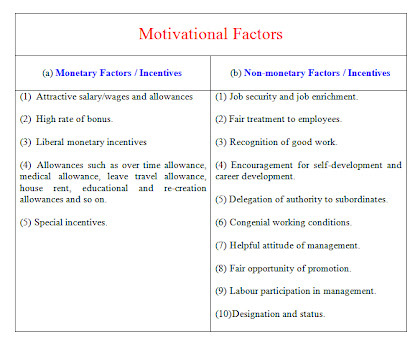 In other words, these factors suggest the measures which can be used for the motivation of employees. In motivation, efforts should be made to satisfy the different needs of employees so that they will be satisfied, happy and away from tensions. This creates favorable environment because of which employees take more interest and initiative in the work and perform their jobs efficiently. Motivation is a technique of creating attraction for the job. It is encouraging employees for better performance in order to achieve the goals of an Organization. The process of motivation is a continuous one (circular one) and is beneficial to both - employer and employees. It is a key to improve work performance of employees. The term 'motive' is derived from the Latin word 'emovere' which means to move or to activate. Motivation is the act of making someone to act in the desired manner through positive encouragement. It is through motivation that employees can be induced to work more, to earn more and to give better results to the Organization. According to W. G. Scot, "Motivation means a process of stimulating people to action to accomplish the desired goals." According to Michael J. Jucius, "Motivation is the act of stimulating someone or oneself to get a desired course of action, to push the right button to get a desired results." Psychological Process : Motivation is a psychological process useful for encouraging employees to take more interest in the work assigned. It relates to human relations. Initiative by Manager : The initiative for motivation is by the manager by offering guidance and also by other methods like appreciation of good work or offering incentives. Management has to adopt special measures for motivating employees. They include monetary as well as non-monetary. Continuous activity : It is a continuous and circular process. Subordinates need motivation in a continuous manner as their needs and expectations change from time to time. A manager has to study the needs of workers and use the technique of motivation accordingly. The process of motivation must be made a regular and continuous one. Goal-oriented and action-oriented : Motivation diverts human behavior towards certain goals. Attainment of organizational and individual goals depends on the motivational plans. Broad concept : Motivation covers needs, human relations and satisfaction of employees. For employee motivation, monetary and other incentives need to be offered. Job satisfaction is one such need and is useful for their motivation. Essence of management process : Motivation is an essential function of a manager. He has to motivate his subordinates for achieving organizational objectives. Motivated labour force is an asset of a business unit. Motivated employees bring prosperity to a business unit. 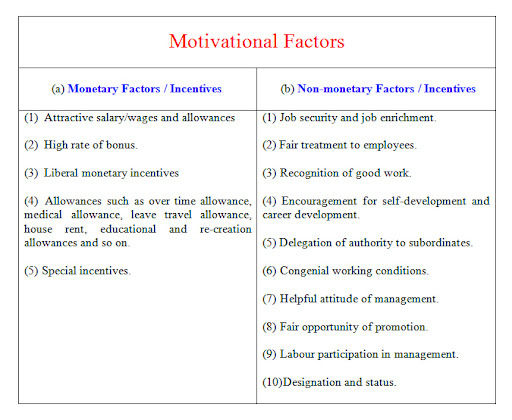 Beneficial to employees and management : Motivation offers benefits to employees and Organisation. It avoids crashes and encourages cooperative outlook among employees. Motivation leads to cordial labour-management relations. It provides more profit to management and better welfare to employees. Varied measures available for motivation : For motivation, various monetary and non monetary incentives can be offered to employees by the management. Attractive wages, welfare facilities, job satisfaction, appreciation of good work, encouragement to self-development, job security and fair treatment are some measures of motivating employees. Motivation is different from satisfaction : Motivation implies a drive towards a result while satisfaction involves result already experienced and achieved. 'When desire is satisfied, employee is motivated'. Related to a person in totality : An employee is motivated in totality and not in part. Employee's basic needs are interrelated. Management must fulfill all the needs through monetary and non-monetary incentives. Motivation occupies an important place and position in the whole management process. This technique can be used fruitfully for encouraging workers to make positive contribution for achieving organizational objectives. Motivation is necessary as human nature needs some sort of inducement, encouragement or incentive in order to get better performance. 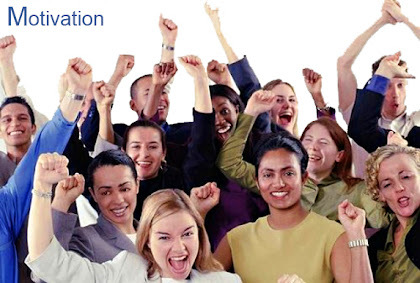 Motivation of employee’s offers may benefits to the Organisation and also to the employees. This suggests the importance of motivating employees. Motivation acts as a technique for improving the performance of employees working at different levels. Motivation of employees is one function which every manager has to perform along with other managerial functions. A manager has to function as a friend and motivator of his subordinates. Motivation is useful in all aspects of life and even our family life. The same is the case with business. This dearly suggests that motivation is extremely important. It is an integral part of management process itself. Increase in the efficiency and productivity of employees. Motivation ensures a high level performance of employees. Better co-operation from employees and cordial labour-management relations. Reduction in the rate of labour absenteeism and turnover. Reduction in the wastages and industrial accidents. Improvement in the morale of employees. Quick achievement of business/corporate objectives and favorable corporate image. Employees get various monetary and non-monetary facilities/benefits which provide better life and welfare to them. Security of employment and other benefits due to cordial relations with the management. Job attraction and job satisfaction. Higher status and opportunities of participation in management. Positive approach and outlook of employees towards company, management and superiors. Reduction in the rate of labour turnover which is harmful to employees and management. Better scope for improvement in knowledge and skills of employees. Monetary incentives are offered in terms of money. Such incentives provide more cash or purchasing power to employees. Monetary incentives are extremely attractive to employees (particularly those working at lower levels) as they get the benefit quickly and in concrete terms. At the higher levels of management, non-monetary incentives are more important than monetary incentives. Workers prefer monetary incentives as compared to non-monetary incentives. Managements also offer liberal monetary incentives to all categories of workers. Individual Monetary Incentives : The benefit of individual monetary incentive is available to concerned worker only. For example, F. W. Taylor suggested differential piece rate system which offers different wage rates to different workers as per their production efficiency. Different incentive wage plans are the examples of individual monetary incentives as the benefit is offered individually to every worker. Here, a worker is paid as per his efficiency, productivity or as per the production given by him. Efficient/sincere workers give more production and get higher reward in terms of wage payment. Group Monetary Incentives : In the group monetary incentives, the monetary benefit is not given individually but to a group of workers or to all workers in the Organisation. Workers have to work jointly/collectively as a team in order to secure the benefits of group monetary incentives. Bonus payment, pension, P.F, production/productivity bonus, profit sharing, etc. are the examples of group monetary incentives. For the employer/management, group incentives are more important as they offer many benefits to the management. Job security and job enrichment : Job security is useful for the motivation of employees. Such security keeps the employee away from the tension of becoming unemployed. Job enrichment provides an opportunity for greater recognition and advancement. Job enrichment refers to redesign of jobs. Fair treatment to employees : Employer should give attention to the needs, difficulties and grievances of employees. Small work groups and effective communication are useful for solving the problems of workers. Employees must be given decent treatment. They will be co-operative only when they are treated with sympathy and love, affection and dignity. Employees should also be given help in personal matters. Recognition of good work : Recognition of good work at an appropriate time gives encouragement to employees to show better performance in future. As an appreciation of good work, prizes, rewards, promotions, etc. should be given. Encouragement to self-development and career development: Employees should be given varied training facilities. Training facilitates self-development and also provides opportunities for career development. Every employee has a desire to grow, develop and rise higher. This desire should be exploited fully for motivating employees. For this, training as well as management development programmes should be introduced. Delegation of authority : Due to delegation of authority, a subordinate employee feels that superior has faith in him and also in his ability to use authority in a proper manner. Employees get mental satisfaction when authority is given to them. They take interest and initiative in the work and try to prove that they are competent to work at the higher levels. Thus, delegation of authority becomes a motivating factor. Congenial working conditions : It is a non financial incentive for motivation. Employees should be given various facilities and conveniences at the work place. The work environment should be pleasant and safe. This creates desire to work efficiently. Helpful attitude of management : The helpful attitude of management towards its employees creates a sense of affinity for the Organisation. Fair treatment to workers creates better understanding among workers. Cordial industrial relations also motivate employees. Thus, enlightened and pro-employee attitude of management acts as a motivating factor. Fair opportunity of promotion : Fair opportunity of promotion to all eligible workers is one more method useful for motivating employees. They take interest in the work as they feet that they will be rewarded in the form of promotions. Training facility should be provided to employees in order to make them eligible for promotion. Labour participation in management : Labour participation in management is useful for the motivation of employees. Workers get higher status and better scope for expressing their views through such participation. Even the formation of quality circles or joint management councils is useful for motivating employees. Designation and status : When an employee is provided with a better designation, it adds to his status. Employees are proud to reveal their attractive and high-sounding designations. Maslow's Hierarchy of Needs Theory. Douglas McGregor's Theory X Theory Y. The most famous of all human relations movement and research were Hawthorne Experiments. So named because they were carried on in Hawthorne plant of western Electric Company of Chicago in USA. Dr. Elton Mayo led a team from Harward University which cooperated with western electric co. in the period 1927-1936 to carry out Hawthorne Experiments. They identified following details. Recognized the importance of employee attitudes such as understanding voluntary co-operations and willing dedication in accomplishment of organizational goals. Found that employee performance is very much influenced by his attitude towards his job, associates and management. Proved that organizational firm can gain only when its employees are satisfied contented in their jobs. Pointed out that any change to be should be made should be explained and its meaning should be clear to employees. The fact that change is logical is not enough because employees may not appreciate the logic. Explored much of information on group behavior. Thus have provided the basis for much of what we know about getting along with all, problem employees in particular. very good presentation on a driving force behind performance-motivation.Any organization if it aims at excellence and expertise should motivate its employees through their training programs so that the best in the employees comes out and it will be for the good of both the employer and the employee.